The Supreme Court’s health care decision sent a wave of relief through Massachusetts that the benefits of President Obama’s landmark law will remain intact: hundreds of millions of dollars promised for the state Medicaid program, hospitals, community health centers, and other providers. Thousands of consumers also can continue to count on federal aid to help pay for their prescription drugs, young adults up to age 26 can remain on their parents’ insurance plans, and thousands more Massachusetts residents will get help paying their insurance premiums. After the initial surprise that the mandate to buy insurance survived, political and industry leaders said the difficult work ahead to control soaring health care costs now will attract much greater national scrutiny — given that the state’s health insurance overhaul became the model for the national plan. The upholding of most of the Affordable Care Act removes a distraction and uncertainty, and the leaders said they will sharpen their focus on passing a plan to improve care and cut costs now being negotiated in the Legislature behind closed doors. The architects of the 2006 Massachusetts law felt more than a little honored that their first-in-the-nation strategy will be carried forward nationally. Andrew Dreyfus, chief executive of Blue Cross Blue Shield of Massachusetts, experienced a similar moment of exultation. “It feels like a clear validation of the framework we developed in 2006,” said Dreyfus, who worked for passage of the 2006 law as director of the insurer’s foundation. The decision to uphold the central, and most controversial, provision of the federal law — the requirement that most individuals buy health coverage or pay a tax penalty — matters little to Massachusetts, since the state already has a similar mandate that has reduced the number of uninsured to about 2 percent. But a repeal of other portions of the law could have had a significant financial impact. While the court weakened the law’s huge Medicaid expansion, ruling that states cannot be required to participate, Massachusetts already has expanded coverage to the extent required by the law. As a result, the federal government will send nearly $2 billion to Massachusetts over six years, starting in 2014, to pay for Medicaid coverage for childless adults. An increase in federal payments to cover children will offset another $100 million in state spending annually between 2016 and 2019, according to an estimate by the Center for Health Law and Economics at UMass Medical School. Lynn Nicholas, president of the Massachusetts Hospital Association, said her members will push the state to use the windfall to increase Medicaid rates for hospitals — a boost especially needed to partly offset $5 billion in cuts to the growth of Medicare payments to Massachusetts hospitals expected between now and 2019. Under the federal law, reductions to Medicare spending nationally will help pay for health care coverage for many of the 50 million uninsured Americans. The state’s network of more than 280 community health center sites, which already received more than $80 million for expansion of operations and construction under Obama’s law, could get millions more. Money also has been flowing to consumers. 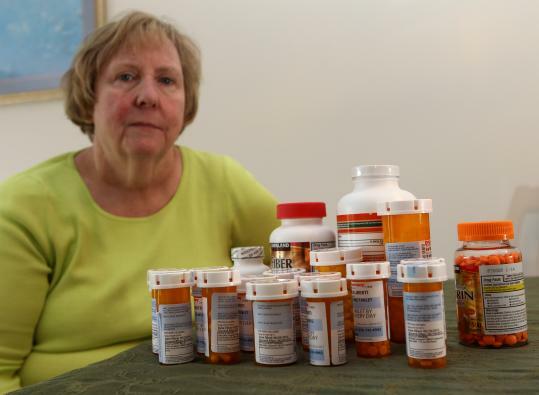 Pat Liberti, a 62-year-old disabled nurse who lives in Salem, takes 18 medications daily for heart disease, diabetes, and other health problems. She is one of more than 62,000 seniors and disabled people in Massachusetts who will continue to see significant savings on prescription drugs from a provision in the law that is gradually narrowing a gap in Medicare drug coverage called the “donut hole.” Under the law, she now only pays half the cost — $200 — of a 60-day supply of one of her heart drugs. She and her husband would have faced some tough choices if the law had been overturned. “We might have had to sell our home to use the equity in that,” Liberti said. The 2006 Massachusetts law provided subsidized insurance to people making up to three times the federal poverty level, or $33,500 for an individual this year. Under the federal law, that will be extended in 2014 to those earning up to four times the poverty level. On Thursday afternoon, about 20 health care executives, advocates, state employees, and patients crowded into a small Statehouse conference room for a news conference and exchanged congratulatory hugs. But in their public comments, the focus quickly turned to cost containment. House and Senate leaders are privately negotiating over their two competing plans to control medical spending and hope to reach an agreement by the end of next month, which Governor Deval Patrick also must sign on to. “To some degree, there was a big ‘if’’ hanging over the discussion on cost containment,” said Senator Richard T. Moore, Democrat of Uxbridge. He oversaw development of the Senate proposal and is on the negotiating team. The decision “adds a degree of certainty,” he said. Dr. Gary Gottlieb, chief executive of Partners HealthCare, pointed out that the Massachusetts health care industry already is transforming how hospitals and doctors are paid and improving the coordination of care for patients, without increased government regulation. The federal law promotes this change as well, “creating a synergy’’ with the private market, he said. Robert Huckman, cochairman of the Healthcare Initiative at Harvard Business School, said the Massachusetts model will be judged on whether it went beyond universal coverage to creating a better health care system. “That would be the ultimate vindication for the model, to show it can reduce costs and improve quality,” he said. Globe reporter Brian Ballou contributed to this story. Liz Kowalczyk can be reached at kowalczyk@globe.com. Chelsea Conaboy can be reached at cconaboy@boston.com. Kay Lazar can be reached at klazar@globe.com.